In secs. 11.3 and 11.7 we analyzed the requirements of theories for the accretional process. The observed properties of many body systems with collisional interaction, and resulting from net accretion, were discussed in ch. 4 (the asteroid populations) and in ch. 14 (the comet-meteor complex). The meteorites are bodies that also belong to such systems; among objects with Earth-intersecting orbits they form a residue of material sufficiently cohesive to survive passage through the atmosphere. They are of particular interest since they can be studied in minute detail in the laboratory. Until we can sample well-defined small bodies in space, analysis of meteorites therefore provides the most direct evidence for the early evolution of primordial materials. The potential of these analytical data cannot however, be fully utilized until we understand the basic processes that have produced the meteorites. We are far from this today. The chemical and petrographical observations are mostly interpreted in terms of models that are in some essential respects divorced from modern knowledge of the behavior of matter in space and are in conflict with some laws of physics. More specifically, the formation of the material now in meteorites is commonly attributed to the condensation of grains from a body of gas adjusting its temperature to that of the growing grains. Such a process can be realized in the laboratory but not in space. The reason is that under wall-free conditions the temperature of a condensing solid is different from the kinetic temperature of the surrounding gas in the optically thin surface region of the gas body where radiative cooling and, hence, condensation, is effective. This fact was recognized in space physics many years ago (Lindblad, 1935; Spitzer, 1968) and has been the subject of more recent analysis (Lehnert, 1970a; Arrhenius, 1972; Arrhenius and De, 1973); yet most interpretations of phenomena observed in meteorites still fail to take this into account (see, e.g., review by Grossman and Larimer, 1974). Furthermore, the Laplacian concept of a homogeneous gas disc provides the general background for most current speculations. The advent of magnetohydrodynamics about 25 years ago and experimental and  theoretical progress in solar and magnetospheric physics have made this concept obsolete (sec. 15.6), but this seems not yet to be fully understood. By analogy with phenomena familiar from geology of the Earth, the properties of meteorites are often thought to be due to processes inside and on the surface of hypothetical planets which later have "exploded" and thrown out the meteorites as debris. Such bodies are assumed to have had gravitational fields large enough to produce gravitative differentiation and to retain an atmosphere; in other words to be larger than the Moon. It is not generally realized that there are no known processes by which such large bodies can be blown apart, especially as this must be done in such a delicate way as not to destroy the fragile structure of some meteorite materials (sec. 22.4). In short, the con common current attempts to interpret meteorite data have led to contradictions that should be removed' by a unified physical and chemical approach. The theories involved must not only account for the phenomena observed in meteorites, which, are often ambiguous, but must at the same time be compatible with all other observed properties of the solar system and with modern experimental knowledge of the behavior of particles and fields in space. The information from meteorites differs substantially from knowledge about the materials making up planets and satellites which is discussed in ch. 20. We do not know where the individual grains condensed, which after more or less extensive alteration provided the material for the meteorite precursor bodies. Nor can we reconstruct with certainty and in any detail the orbits in which these precursor bodies evolved. Several sources of meteorites have been proposed and mechanisms have been suggested for the transport of the meteoroids to Earth-crossing orbits without destruction of the material by sudden change in orbital energy. One such source consists of near-Earth objects such as the Apollo and Amor asteroids, or (which may be the same) comets which come close to or intersect the Earth's orbit (secs. 4.6.1 and 19.6). Estimates of the chemical composition of Giacobinid and Perseid fluffy meteors from their emission spectra indicate a close similarity in their elemental composition to that of the much more compact chondritic meteorites (Millman, 1972). The Giacobinid showers are associated with Comet Giacobini-Zinner and the Perseids with Comet Swift-Tuttle (see ch. 14). This evidence would thus indicate that the composition of chondrites is not incompatible with their suggested cometary origin. Measurement of the light emission from other comets, however, indicates considerable differences in chemical composition from any known type of meteorites. This is suggested particularly by the widely different intensities of sodium D emission in different comets at comparable solar distances. In several cases notable emission of sodium occurs at solar distances as large as 0.5-1.2 AU (e.g., Bobrovnikoff, 1942; Swings and Page, 1948; Greenstein and Arpigny, 1962). Hence if any groups of meteorites are of cometary origin, they would seem not to be representative of all common types of cometary materials. Another possible source region suggested for meteorites is the asteroid belt. This has been investigated by Opik (1963), Anders (1964), Arnold (1965), Wetherill and Williams (1968), and Zimmerman and Wetherill (1973), but conclusive arguments have yet to be produced demonstrating that this source can give rise to the observed flux of meteorites. Measurements of the reflection spectra of a number of different asteroids (McCord et al. 1970; Chapman, 1972a; Chapman and Salisbury, 1973; Johnson and Fanale, 1973) indicate varying types of surface materials, some similar and others dissimilar to known types of meteorites. Since this type of analysis does not yield very distinctive spectral signatures, it is difficult to decide whether there are genetic relationships between asteroids and meteorites or if those cases where similarities exist in the broad reflection features are coincidental and due to the fact that there are only a limited number of types of materials in the solar system. Some of the most common types of lunar rocks, for example, bear a close optical resemblance to a certain type of meteorite (basaltic achondrites), but these two materials are unlikely to be identical genetically. In conclusion, it does not appear possible at the present time to identify individual meteorites or groups with specific source regions. Most of the meteoroids approaching the Earth are destroyed in the atmosphere. It is estimated that, even of the big meteoroids entering the atmosphere, only one in several hundred has sufficient cohesive strength to reach the surface. From the retardation of meteors that burn up in the atmosphere, it has been concluded that they have a mean bulk density of about 0.8 g/cm3 (Verniani, 1973), indicating that they are fluffy aggregates (Verniani, 1969, 1973; McCrosky, 1970). ....there is also a chemical selection effect is uncertain; the meteor emission spectra referred to in sec. 22.2 do not appear sufficiently distinctive to show the differences characteristic of the various types of stone meteorites. Most meteorites investigated are clearly fragments of larger bodies, generally referred to as meteorite parent bodies. Particularly by study of nuclear transformations induced by cosmic rays, and of radiation damage in the material, it has been possible to reveal facts bearing on geometry of shielding and duration of exposure of the material. Such measurements, which are discussed in more detail in sec. 22.9, confirm that the size of some of the bodies in the chain of precursor stages of meteorites must have exceeded the order of a few meters. The largest possible size of any of the members in the sequence of meteorite precursor bodies can be estimated in different ways. One boundary is set by the size at which fragments of such a body, if it could be fragmented, would remain held together by gravitation. It is doubtful if a body larger  than about a thousand kilometers in size can ever be blown apart by collision with any other body in the solar system. It is also clear from the spin distribution of asteroids that they cannot originate by explosion of much bigger bodies. This is discussed in sec. 9.7-9.8. A limit to precursor body mass is also imposed by the structural change in the meteorite material accompanying instantaneous acceleration to escape velocity at collision. Meteorites with delicate, well-preserved structures and low cohesive strength, such as many carbonaceous and ordinary chondrites (see fig. 7.1. I ), can hardly have been explosively accelerated to more than a few hundred meters per second and probably less. A body, for example, with and has an escape, velocity To break up such a body requires an explosive event which on the Earth's surface would throw a large part of the debris up to a height of more than 600 m. It is questionable whether the fragile structures observed could tolerate such accelerations. If not, we may conclude that any one of the series of precursor bodies of such a meteorite must have been less than some 10 km in size. Sizes of a hundred or a few hundred kilometers have been inferred from current interpretations of diffusion controlled crystal growth features in iron meteorites. These were believed to indicate cooling slow enough to require insulation thicknesses ranging up to the sizes quoted. However, the thermal history recorded in iron meteorites does not necessarily reflect a monotonic cooling from a high temperature state. It is more likely to have been a long series (N~106) of heating events due to gas friction in the nebular medium in the inner solar system (see sec. 21.12.2). Each such heating event could be of short duration (the inner solar-system fraction of elliptic orbits originally with aphelia in transplanetary space), and the amplitude of the maximum heating would decrease monotonically in time Under these circumstances the objects could have been less than a hundred meters in size and still produce the observed features if they are a cooling phenomenon. From the fact that parent bodies of meteorites must have existed, mostly considerably larger than the meteorites themselves, the question arises how these parent bodies were generated. This is in principle the same problem as the early growth of planetary embryos. We have seen in ch. 11 that the only physically acceptable mechanism so far specified for this is planetesimal accretion. This means that all composite bodies in the solar system must have formed by aggregation of smaller bodies and ultimately  of small, condensed grains. Hence, in order to understand meteorite parent bodies we have to consider their accretion by a jet-stream mechanism. As we have discussed earlier (secs. 6.6 and 12.2), "jet stream" is a convenient term for an assemblage of grains moving in similar Kepler orbits and interacting with each other either by collisions or with a gas as an intermediary. The reason why a jet stream keeps together can be described in a number of ways: by the focusing action of a gravitational field, by diffusion with a negative diffusion coefficient, or by the action of an "apparent attraction" or dynamic attraction between the grains. Meteor streams and asteroidal jet streams are likely to be jet streams of this kind; they have been discussed in secs. 4.3.3 and 4.6.2. The profile of an asteroidal jet stream is shown in fig. 4.3.6. In the focal regions the relative velocities are found to be as low as 0.2-1.0 km/sec. This refers to visual asteroids with the size of 10 km or more. These are likely to be accompanied by a large number of small bodies which interact more frequently. Their relative velocities should therefore often be much smaller -less than 100 m/sec. Hence, a jet stream should be depicted as a region where grains in similar orbits collide with a range of relative velocities. The average velocity is initially high, resulting in fragmentation, melting, and vaporization. As a result of the gradual dissipation of energy by collision or gas friction the average internal velocity decreases with time. When a certain fraction of the population has attained relative velocities of the order of 10 m/see, interparticle adhesion becomes effective (sec. 7.4) and accretion into larger bodies can begin. During this evolution the grains and grain aggregates, forming, breaking up, and regrouping while orbiting in space, are exposed to irradiation by cosmic rays. Gas molecules may be retained in a jet stream by means of the apparent attraction. As in meteor streams, density waves may produce local concentrations (bunching) of particles, which may possibly sometimes result in the formation of comets (sec. 14.3). Much of the history of meteorites should be studied with the boundary conditions for formation and evolution of comets as background. We shall now discuss to what extent the properties of meteorites reflect the conditions in the particle streams from which they developed. Some types of meteorites, particularly the carbonaceous chondrites, have a high proportion of single crystals and crystal aggregates with high content of volatiles remaining occluded in the structure from the time of condensation, and with delicate growth and irradiation features perfectly preserved (see  fig. 7.1.1). It is obvious that these particles have not undergone hypervelocity collisions in the course of their aggregation into larger bodies. Hence it is likely that they have accreted in parent jet streams with sufficiently high gas content to achieve equalization of energy mainly by gas friction, and only to a limited extent by high-energy grain collision. On the other hand, chondrules, the most abundant meteorite component, are rounded particles of silicate and other materials, with structure indicating rapid quenching from melt or vapor. Meteoritic chondrules are probably a result of hypervelocity collision between single particles or small aggregates. Chondrules also form at impact on an aggregate of large dimensions such as the lunar soil, but in this case the proportion of chondrules and chondrule fragments is mostly small compared to fragmented debris and glass spashes, in contrast to conditions found in chondritic meteorites (Fredriksson et al., 1973). The proportion of chondrules and chondrule fragments in a meteorite in relation to components unmodified by collision after their primordial condensation is thought to be a measure of the relative importance of collision and gas friction as energy-equalizing processes, and hence of the gas content, in any specific meteorite parent jet stream. 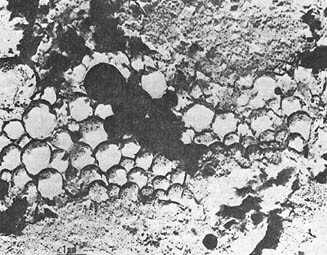 Carbonaceous chondrites of Type I (Wiik, 1956), for example, have no chondrules or chondrule fragments, while in ordinary chondrites a large fraction of the mass consists of recognizable chondrule fragments and a varying amount of unbroken chondrules. Other manifestations of high-velocity collisions in parent jet streams are (1) deformation, particularly noticeable in nickel-iron metal grains (Urey and Mayeda, 1959); (2) fragmentation; (3) shock phenomena (see, e.g. 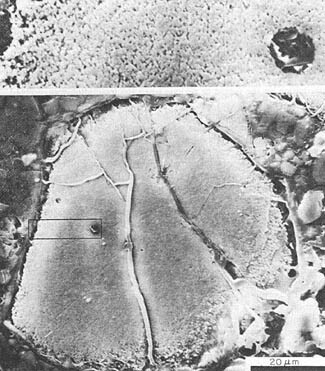 French and Short, 1968; Neuvonen et al., 1972); and (4) complete melting of sufficiently large volumes of material to form igneous rocks (Duke and Silver, 1967), which have been reduced to rubble in subsequent collision (see fig. 22.8.1). A wide range of examples of such collision effects is also found in the lunar surface material, where, however, the relative extent of the various phenomena differs from the meteorites. This is likely to be due to direct and indirect effects of the substantial gravitational field of the Moon. In these collision phenomena a high degree of inelasticity characterizes the encounter; i.e., the structure of the collision product shows that substantial fraction of the kinetic energy of the colliding bodies has bee converted into heat by fracturing, deformation, melting, and vaporization This is of interest since the degree of inelasticity is a controlling parameter in the focusing of a jet stream (ch. 6). The material in chondrites is found to be in various states of welding due to heating either at the time of its formation (Reid and Fredriksson, 1967) or at some later time (Van Schmus and Wood, 1967). A suggestive reason  for such heating after aggregate formation is gas friction in the inner region of the solar system analogous to meteor heating in the Earth's upper atmosphere and discussed in sec. 21.12. Hence there is no need for ad hoc assumption of enhanced emission of corpuscular radiation from the Sun or other heat sources (sec. 22.9). When the internal energy of a jet stream has decreased sufficiently, collisions on the average cease to be disruptive and statistical net growth of aggregate bodies (embryos) is in principle possible. For this to take place, however, a cohesive force must necessarily act between the particles; in view of the small masses involved, interparticle gravitation is ineffective as such a force. The exploration of the Moon, particularly the investigation of the bonding forces in particle aggregates on the lunar surface, has pointed at two processes as being of importance for initiating cohesion in the space environment: electrostatic bonding and vapor deposition (sec. 7.4). Aggregates established by these processes can subsequently be compacted by shock. The fluffy state achieved by vapor deposition and by the persistent internal polarization in lunar dust particles exposed to the space environment has also been discussed in sec. 20.4(2). The cohesive force between the grains ranges between 10 and 170 dyn with dipole moments averaging a few hundred coulomb/cm. For such forces to cause adhesion at grazing incidence of orbiting grains, their relative velocities need to be lowered into the range of 10 m/sec from the order of magnitude of a few thousand m/sec characteristic of initial grains hitting each other in a jet stream. FIGURE 22.7.1.- Section through a cluster of spheroidal magnetite crystals in the carbonaceous chondrite Orgueil (From Kerridge, 1970; replica electron micrograph.) Assuming that the cluster is as high as it is wide, it consists of at least a thousand spheroids. Each of these spheroids appears to be a single magnetite crystal with a faceted surface. The crystals are easily detachable from each other and are presumably held together magnetically. Loosely bonded clusters like these are likely to have accumulated at orbital relative velocities of the individual spheroids in the range below 10-100 m/sec. ....the distribution of matter, it is necessary to consider the hydromagnetic processes active in space today and in the hetegonic era (see chs. 21 and 23). The magnetite grains in carbonaceous meteorites such as those shown in fig. 22.7.1 crystallized and or aggregated at grain temperatures below about 800K (Brecher, 1972c; Brecher and Arrhenius 1974, 1975) from a magnetized plasma at a temperature that was probably an order of magnitude higher (sec. 22.1). This magnetite is characterized by an exceptionally low nickel content (Bostrom and Fredriksson, 1966). The grains also lack the microscopic inclusions of metallic nickel which are characteristic of oxidized nickel-iron particles. Hence this magnetite could hardly be derived by oxidation of nickel-iron metal as is sometimes assumed. The record in meteorites, discussed above, substantiates the self-evident but nonetheless commonly neglected fact that the immediate precursor bodies, from which the meteorites were derived, must themselves have been aggregated from smaller bodies in a chain of collision events extending over a considerable period of time. Above some critical energy, depending on the material properties of the colliding bodies (see secs. 22.6-22.7), the collisions must be disruptive; below this level, they would result in accretion. From the fact that a population of large bodies now exists it is clear that accretional collisions for some time have prevailed over disruptive ones. In the early part of the history of the jet streams the reverse must have been the case in order for orbital energies to equalize and to account for the record of aggregate disruption, particle fragmentation, and extensive melt and vapor spray formation represented by some meteorite material. A schematic representation is given in fig. 22.8.1 of the processes involved and the products observed. The discussion in ch. 12 shows that a satisfactory physical explanation of the accretion of the secondary bodies in the solar system requires continuous or intermittent emplacement of source gas and possibly also dust in the circumsolar region during a time period of the order of 108 yr. Recent innovations in radiochemical and mass spectrometric analysis of meteoritic materials have made it possible to resolve at an unprecedented level of precision the events that controlled the evolution of these materials in their formative era (Wasserburg et al., 1969; Papanastassiou and Wasserburg, 1969; Gopalan and Wetherill, 1969; Papanastassiou et al., 1973). Other measurements permit conclusions regarding subsequent events in individual meteorite parent jet streams evolving into bodies, some of which yielded the meteorites by fragmentation. The observations of particular importance in this context are discussed in the following sections. FIGURE 22.8.1. Flow diagram of collision processes (indicated by directional arrows) in assemblages of particles and particle aggregates moving in Kepler orbits (jet streams). ....meteorite groups; for example, the various groups of chondrites. The fact that these groups are chemically distinct with regard to proportions of different refractory elements suggests that the particular material from which the succession of meteorite precursor bodies must have been accreted existed as separate streams in space. These streams were maintained as largely separate reservoirs during the orbital evolution of meteorite material up to the most recent stage of formation of the meteorites in each stream. Occasional exceptions to this rule are of equal interest, where an isolated chunk of material of one chemical type has been aggregated together with a major mass of material of another composition (see, e.g., Fodor and Keil, 1973). This indicates that separate jet-stream reservoirs existed close to each other in velocity space, so that material could occasionally although infrequently be scattered from one stream to another. The establishment of the distinct chemical characteristics of the material in any jet stream could have taken place (a) in the generation of individual source clouds (sec. 21.11), (b) in the process of release of infalling matter from ionized source clouds by deionization (sec. 21.11), (c) as a result of the critical velocity phenomenon at emplacement (sec. 21.11), (d) in the process of condensation (Arrhenius and Alfvén, 1971), or (e) in the case of elements more volatile than those discussed here, by loss from the jet streams of a fraction of collision-generated vapor. Hence we do not know very much about the establishment of the separate closed systems which are suggested by some groups of meteorites with different elemental and isotopic composition. Nonetheless, a fact of importance is that such groups exist and have been maintained as largely separate entities. A particularly interesting case of refractory reservoir closure is that of strontium, since the subsequent generation of the isotope Sr87 by radioactive decay of Rb87 provides chronological information. From highly precise measurements of the present contents of Sr87 and Rb87 (normalized to Sr86) Wasserburg and his collaborators (Papanastassiou et al., 1973) have demonstrated a range of initial Sr87/Sr86 ratios in different meteorites and meteorite groups. They have shown that this range represents a time interval of at least 107 yr and chose to interpret it in terms of condensation events. However, in principle the concept can be expanded to refer to an interval of any of the events under (a) through (d) above. These are based on the accumulation of radioactive decay products inferred or measured in individual crystals. The system proven most practical and useful in space materials is that of Rb87/Sr87. The age defined is the latest event of crystallization. Petrological investigations sometimes  make it possible to suggest whether the crystallization took place (a) from a low-density gas and hence marks a primordial condensation event, (b) from a dense gas or supercooled liquid suggesting crystallization from collisional melt and vapor spray, (c) from a comparatively slow-cooling melt generated by planetesimal collisions in the jet stream where the parent planetesimal of the meteorite ultimately developed, or (d) by the pericentric frictional heating mechanism (secs. 21.12, 22.4). Measured crystallization ages range over about 150 million yr from a maximum age of 4700 million yr (Wasserburg et al., 1969; Papanastassiou et al., 1973). 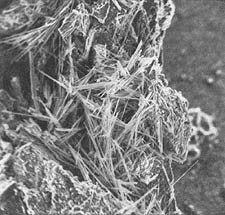 Consequently, 150 million yr is the known range within which initial crystallization and recrystallization events took place and within which the meteorite parent jet streams underwent their early development, some of them dissipating their initially high internal energies by gas friction, others by collisions with sufficiently high relative velocities to cause melting and recrystallization. In decay systems where the daughter nuclide is a gas, the amount of this relative to the parent nuclide (inferred or measured) marks the time when the host solid was generated by condensation at sufficiently low grain temperature or when hot solids had cooled enough to become capable of retaining the gas in their structure. The decay system I129/Xe129 with a half-life of about 17 Myr is of particular interest since it is capable of measuring events on the time scale of the formative era, the order of 100 Myr (Hohenberg and Reynolds, 1969; Podosek, 1970). Since the parent nuclide in this case is also relatively volatile, high-energy grain collisions, such as in the development of the jet streams, are likely to largely remove both parent and daughter rather than just resetting the clock by selective removal of the daughter nuclide. In contrast, condensing crystals, which by necessity must have been at E lower temperature than the surrounding gas (sec. 22.1), are bound to retain iodine and xenon from the outset. This is illustrated by the record high I129-generated Xe129 contents in the alkali halogenide silicate condensates characteristic of some carbonaceous meteorites (Mart), 1973). Hence sue! iodine-xenon ages should approximate the condensation ages. Since neither the original abundance of I129 is known, nor the time scale' of source cloud evolution or of the emplacement process, the iodine-xenon measurements yield only relative age values. The range found in the comparatively few meteorites analyzed as yet amounts to a few tens of million years (Podosek, 1970). Additional measurements are likely to expand this range, since plasma emplacement and condensation would be expected to continue over a substantial fraction of 108 yr. The proportion of gaseous decay products such as He4 relative to the refractory parent elements uranium and thorium, or Ar40 in relation to K40 would in ideal cases give the age of crystallization. Gas losses are, however, almost always indicated. Collisional heating appears to be the main cause for such loss, and the U-Th/He and K/Ar ages can consequently give some approximate information on the timing of such events, particularly when structural features suggest that shock is the main loss mechanism (Heymann, 1967). Information on the aggregation history of the meteorite precursor material is provided at a microscopic level by the cosmic-ray particle track (fig. 22.9.1) and ion implantation record in the surface layer of exposed grains (Fleischer et al., 1967a,b; Lal, 1972a; Macdougall et al., 1974; Eberhardt et al., 1965; Wanke, 1965). A present-day counterpart of this phenomenon has been extensively studied in lunar surface materials, where the main source of the plasma is solar wind (1 keV range; penetration about 10-1000 Å in silicates) and solar flares (low MeV range; 0.1-100 µm penetration). In the formative era the solar and planetary plasma clouds are likely to have been the dominant sources of accelerated particles in these energy ranges (sec. 16.8), irradiating particles and aggregates in the meteorite parent jet streams. Hence these phenomena are not necessarily related or are only indirectly related to emission from the primeval Sun. The bearing of some aspects of the particle track record on the embryology of meteorites is discussed in the next section. ...on time scales of the order of 106-109 yr (Arnold et al., 1961); hence dosages can be interpreted in terms of duration of irradiation (comprehensive reviews are given by Honda and Arnold, 1967; Kirsten and Schaeffer, 1971 and Lal, 1972a). The cosmic-ray induced radioactive nuclides used fall in two groups; the majority with half-lives less than the order of 106 yr and one (K40) with half-life exceeding 109 yr. Measurable activities of nuclides in the former group thus place the related irradiation in the recent history of the solar system. The activity of long-lived species does not, however, provide any information on the period or periods when the irradiation was received. Most exposure dosages are, however, for practical reasons, not based on measurements of radioactive nuclides, but of stable spallation products, such as He3. Also in these cases, which form the basis for statistical conclusions, there is usually no evidence indicating when the irradiation was received, what part of the present meteoritic conglomerate was irradiated, or over how many separate intervals the exposure took place. Nonetheless it is tacitly or explicitly assumed in most discussions of these matters, and indeed implied by the term "exposure age," that the material was brought into exposure by one single breakup event and that the total observed dose was accumulated in the time period immediately preceding the fall of the meteorite. This view again derives from the concept of meteorite parent bodies (which are equated with asteroids or cometary nuclei) as having been brought into existence as large bodies without a lineage of predecessors. After this unspecified creation they are supposed to inexorably undergo a one-way degradation process. Such a belief obviously ignores the need to build up the presently observed asteroidal and cometary bodies by a physically acceptable process, specifically by planetesimal accretion (secs. 11.3 and 12.1). In contrast, then, it is necessary to assume that meteorite source material was already exposed to irradiation in the early history of the solar system and that a sequence of destructive and constructive collisions led to repeated shielding and exposure events of which the latest fragmentation, generating the meteorite, is only the last exposure. This is clearly reflected by the lower (MeV range) energy cosmic-ray particle track record (fig. 22.9.1) and by the distribution of keV range ions implanted in a surface layer of the order 103-104 Å.
Wanke (1966) has shown that material irradiated in this manner occurs much more commonly in some types of meteorites than in others (for example, in about 15 percent of all H-type chondrites investigated compared to only a few percent of L- and LL-type chondrites). This probably means that the planetesimals in the H-type parent jet stream spent a longer time in a relatively disseminated state, and that the L- and LL-type material was focused more rapidly, possibly due to an initially narrower spread in velocity space. Similar inferences are suggested by the variability in  frequency of grains with particle track irradiation ranging, e.g., between 30 percent of all grains in the meteorite Fayetteville and ~6 percent in Kapoeta (Macdougall et al., 1974; Wilkening et al., 1971). In addition to irradiated single crystals or crystal fragments, similarly surface irradiated aggregates of various sizes have been found in meteorites (Pellas, 1972; Macdougall et al., 1972; Lal, 1972a). It is likely that such aggregates are more common than the number so far discovered would indicate since their identification in the lithified meteorite material becomes more difficult with increasing size. Such aggregates, which were certainly solidly compacted at irradiation, represent a stage in planetesimal evolution where some aggregates had been lithified, presumably by shock, fragmented again by collision, exposed to irradiation and reimmersed in fine-grained, noncohesive material, which later was also compacted. Among other observed phenomena which illustrate the hierarchical exposure evolution are probably the different exposure "ages" found in different parts of the same meteorite (Zahringer, 1966) and the systematic discrepancies in K40 and Cl36 exposure ages (Voshage and Hintenberger, 1963). Meteorites provide tangible samples of solar-system materials that have not been extensively modified by the processes characteristic of bodies with substantial gravitational fields. From meteorite data alone it is not always possible to unravel the effects of these individual fractionation processes. However, seeing it in the general context of solar-system evolution we can state that the variability in meteorite composition must derive from differentiation (a) before or (b) during emplacement of matter around the Sun, (c) in the course of condensation, (d) during the evolution of the individual meteorite parent jet streams, or (e) during its residence on Earth. The processes of emplacement of already fractionated matter in different regions of the solar system, and of interstellar transport of the source material, as well as other poorly known events further back in time, al introduce fractionation effects. Fractionation processes, taking place in the course of condensation and during subsequent collisional and frictional heating should be considered. The time relationships of events recorded in meteorites need to be considered in the light of the fact that their precursor bodies must b. products of both accretional and disruptive collisions. It is also necessary, to take into account the circumstance that emplacement and condensation of matter in the circumsolar region cannot have been instantaneous, but must have continued over an extended period of time. The accretion, fragmentation and irradiation record in meteorites clearly does not reflect processes taking place in the "regolith" of a planetsize parent body, miraculously created and later exploded. In contrast, this record should be understood as a result of the competing processes of accretion and fragmentation in assemblages of orbiting particles and particle aggregates in the meteorite parent jet streams. In general our knowledge of phenomena relating to the history of the solar system becomes increasingly uncertain the further back we go in time. In studies of primordial solids this principle is to some extent reversed (Pellas, 1972) due to the fact that the decay, particularly of short-lived radionuclides, leaves an early record more accurate than the more recent one. The main limitation of the record from meteorites is that their source regions cannot be identified. The yield from the powerful analytical methods developed for probing meteorites and lunar rocks is consequently likely to increase dramatically when they are also applied to samples from asteroids and comets (Alfvén and Arrhenius 1972b; Arrhenius et al, 1973). For a complete picture of the range of materials in the solar system it is also necessary to obtain information about the entirely unknown structure and composition of solids from the C cloud (sec. 21.11). This includes the giant planets, but they cannot themselves provide samples of unaltered primordial solid material. Instead we need to draw on the small bodies originating from this region, such as the material in the Saturnian rings or in the Trojans (sec. 8.5.3). Exploration of the regular satellite systems of Jupiter, Saturn, and Uranus is also of basic importance for clarifying the chemistry of the hetegonic processes.